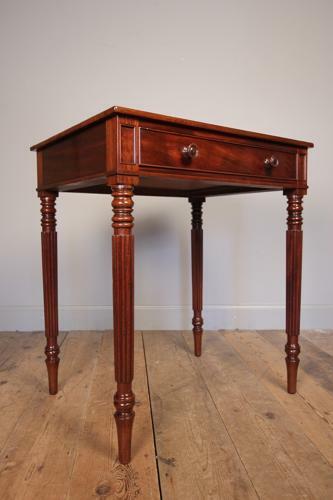 A George IV Mahogany single drawer table in the manner of Gillows, with good proportions. Having a single drawer of which retains the original knob handles, flanked by 2 inset paned and raised on ring turned and reeded tapering legs. Lovely colour and timber throughout this immaculate antique table. English, Circa 1825.